The holiday season is a time of extremes – stress and joy, overwhelming social interactions for some and sadly, a time of isolation for others. For those of us with hearing loss, the holidays can be tough when it comes to communication. Catching up with loved ones in the middle of a busy, festive party can be a challenge. For those of us with loved ones who experience hearing loss, there are a few simple things we can do to make sure everyone feels included. 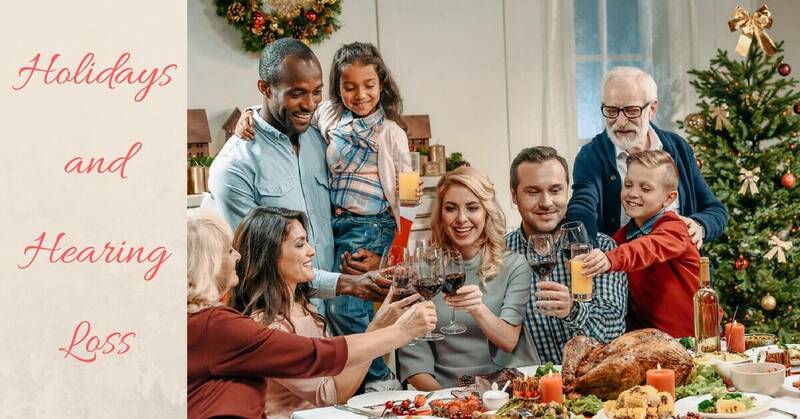 Here are a few tips for enjoying the holidays with hearing loss. First things first – let’s get the tough stuff out of the way. Do you have older family members or friends with hearing loss that you don’t see often? Is there a neighbor with hearing loss who seems to lead a solitary life? The holidays can be a tough time for people who spend a lot of time alone – especially people who experience hearing loss, which can be a socially isolating condition. Take a moment this holiday season to check on your loved ones and folks in your community to make sure they’re doing okay! In the same way you’d ask your party guests about dietary restrictions, take the opportunity to ask people about any accessibility needs they may have. This may include ensuring there’s a washroom on the ground level or accommodating people with hearing loss. When it comes to hearing loss, the key challenge that people face in party situations is background noise. Background noise interferes with the ability to recognize speech – and even with hearing aids, if spaces get too loud, having conversations might be difficult. It may not be party without your favorite holiday music in the background, but try to keep the volume at a reasonable level. Even your guests with normal hearing will thank you! Another tip: turn your speakers to face the wall, away from the general party area. This way you can still have the festive ambiance of holiday tunes – just in a less obtrusive way. When it comes to speech recognition, people with hearing loss may have difficulty understanding multiple speakers in a big conversation. When setting up your party space, consider smaller configurations of tables or chairs so that your guests can have smaller group conversations, rather than one big, rowdy circle. If you currently treat your hearing loss with hearing aids, make sure that your devices are functioning properly and that you have full power with your batteries. Your hearing aids are crucial tools to get you through holiday festivities! If there are accommodations that your party hosts can make, let them know. Ask them to keep the music at a lower volume, and request a seat at the dining table with your back to the wall. This helps you follow conversations better at dinner. In fact, positioning yourself with your back against a wall is a good tip for any sort of conversation. When you have your back to a room full of people, involved in many different conversations, the background noise could pose a difficulty for your own conversation. A wall provides a quiet buffer so you can hear the speaker in front of you. If the party gets too overwhelming, take a break from the loud space or move away to a quieter area for a one-on-one conversation. Are you traveling this holiday season? Make sure you have all of your hearing aid supplies packed. To make your travel easier, sign up for email or text alerts for your flights. If you’re staying at a hotel, notify the concierge of your accessibility needs. Hotels may provide tools to such as vibrating alarm clocks or personal wake-up calls. If you have hearing loss, and you haven’t taken a hearing test and had a hearing aid fitting – now’s the time! Give yourself the gift of hearing this holiday season. Treating hearing loss brings significant benefits to your overall health and well-being – with social interaction an important factor. People with untreated hearing loss tend to be more isolated socially, which could lead to increased risk for depression, anxiety, and even dementia. Treating hearing loss reconnects you to the sounds of your life and to your loved ones. For all of your hearing health needs, visit us at Coweta Hearing. Our team wishes you and your loved ones a happy and healthy holiday season!